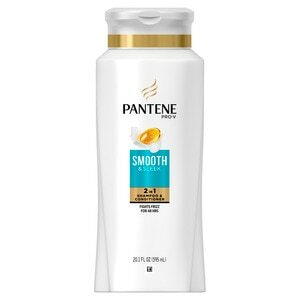 Hydrate your hair in one simple, powerful step with Pantene Pro-V Smooth & Sleek 2 in 1 Shampoo & Conditioner. The Pro-V formula includes a blend of Argan and avocado oils and helps replenish dry hair, fights humidity and gives you all-day frizz control. Experience the hydration and visibly sleek, smooth and glossy results you can get from a single bottle. Water, Sodium Laureth Sulfate, Sodium Citrate, Cocamidopropyl Betaine, Sodium Xylenesulfonate, Stearyl Alcohol, Sodium Lauryl Sulfate, Dimethiconol, Sodium Chloride, Glycerin, Cetyl Alcohol, Fragrance, Dimethicone, TEA-Dodecylbenzenesulfonate, Guar Hydroxypropyltrimonium Chloride, Citric Acid, Sodium Benzoate, Trideceth-10, Polyquaternium-6, Tetrasodium EDTA, Trisodium Ethylenediamine Disuccinate, Polyquaternium-10, Trihydroxystearin, Panthenol, Panthenyl Ethyl Ether, Persea Gratissima (Avocado) Oil, Argania Spinosa Kernel Oil, Methylchloroisothiazolinone, Yellow 5, Methylisothiazolinone, Red 33. Massage into wet hair. Lather. Rinse. Repeat. Gentle enough for permed or color-treated hair.